While visiting an elderly neighbor, Wendy stumbles onto a family secret about a forbidden romance from her grandmother’s generation. Wendy investigates further, but her snooping only seems to create more trouble. Her visits to her neighbor, Mrs. V, land her in trouble with her hopefully-soon-to-be boyfriend, David, when he sees her with Mrs. V’s grandson. Having Alice for a new stepsister was supposed to be fun, but Alice withdraws, barely speaking to Wendy. And even her friend Gayle seems distant. Solving the mystery of what happened to the forbidden couple might soothe Wendy’s curiosity, but it will take more than that to patch up the other relationships in her life. I enjoyed Wendy as a narrator in the first book, 8 Notes to a Nobody, and was excited to jump back into her quirky mind in this story, too. At fourteen, her latest project is making herself David’s girlfriend. 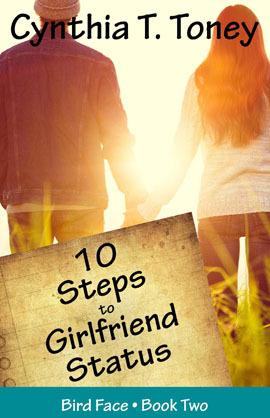 As she pursues a relationship with him—it’s all clean, innocent things—she learns that relationships require more than holding hands and going out on Saturday nights. Respect and trust are essential, as is a basis of friendship. The story unfolds naturally. There’s no moment in which a preachy adult or friend hands Wendy the pearls of wisdom or beats her over the head with them. Everything happens as Wendy’s own discoveries about herself and the world around her. I really appreciated this and thought it was nicely done. I also liked that Wendy doesn’t pursue David using her body or emotional manipulation. I liked that in the midst of all these other things—investigating the past, learning about changes in Mrs. V’s life, pursuing a relationship with her first boyfriend—Wendy is learning to adjust to her new blended family. When Wendy learns that her mom and new stepdad want her to wait until she’s a little older to date, she struggles with this news. Not only is she disappointed, but she feels like her new stepdad is overstepping his bounds, and worries that her mom may not stand up for what she wants and believes and will let her stepdad run the show. They have a long talk about it, one that I felt like was pretty realistic. Everyone articulates his or her side well, even if they don’t all agree. Blending two families isn’t an easy adjustment for anyone, and while it doesn’t dominate the story, I appreciated that it was an element included. I liked that it was a functional version of what blending families can be. We often see the dysfunctional versions in literature, so I was glad to see smart adults making good calls but again, not driving the story or taking over the scenes. Wendy remained the protagonist and the truth-seeker throughout the entire story. For late elementary and middle school readers, this is a light, fun story that introduces relationships on a lot of different levels: Wendy’s mentoring/grandparent-like relationship with Mrs. V; the changes in her relationships with her new stepfamily; her relationships with Sam and David. The forbidden relationship in Wendy’s past explores an interracial relationship, and the challenges faced by the two in a generation much less tolerant than today. The details about that struggle are brief and vague, but the story definitely communicates that this was a big challenge for a couple of that time period. Toney does an excellent job introducing deep topics like this in a way that makes them accessible to younger readers but maintains a light story. Wendy really wants David to be her boyfriend. In her mind, there are ten steps she’ll need to complete in order to make this happen. As the story unfolds, she mentally checks off the steps. They are things like meeting his family, and eating lunch together. There is one brief kiss on the lips. Wendy and David’s families attend church. Tagged 10 Steps to Girlfriend Status, Author Copy, Bird Face, Blended Families, Cynthia Toney, interracial relationships, Write Integrity Press. Bookmark the permalink. I love your list of review items for a clean story. Thank you. I’m going to use them in our group forum. Wonderful idea. A great, comprehensive review. I’ll be happy to share this series with my daughters when they’re a little older – not that there’s anything inappropriate for them now, but just that their interest in relationships hasn’t blossomed yet. The oldest is only 8-1/2. Seems like she might take an interest in the first book around 11 or 12. We’ll see.